A) You get hungry all over again looking at the photos. B) You pawn leftovers off on neighbors because the temptation is too much to handle. D) You simply cannot wait to share it. This recipe satisfies all of the above. 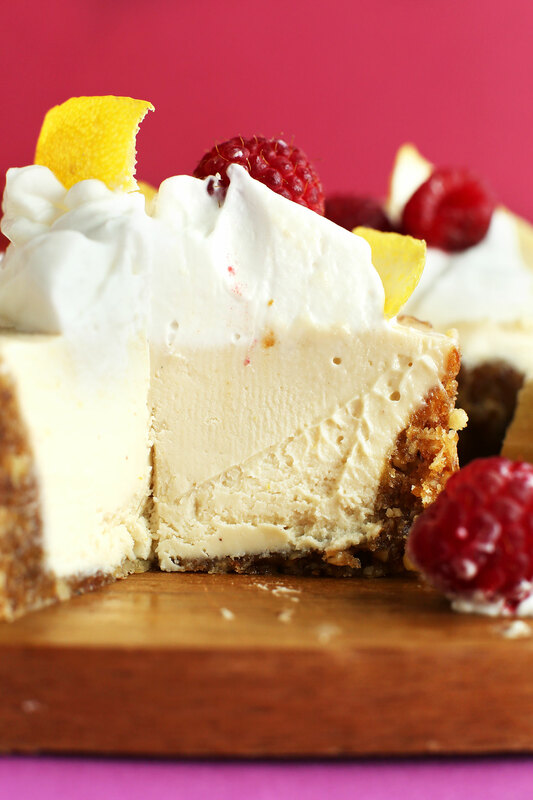 Who’s ready for some (vegan, gluten-free) cheesecake!? After having such great success with my No-Bake Chocolate Cheesecakes, I couldn’t shake the thought that it was the cocoa butter in the dark chocolate that helped the cheesecakes firm up and hold their shape so well even unrefrigerated (a complaint I had with my earliest prototype – still delicious, just a little soft). So I ordered some cocoa butter to test my hypothesis. Spoiler alert – my suspicions were dead on. This cheesecake is simple, requiring just 10 ingredients and 1 bowl (or blender/food processor). And it all starts with a simple, 3-ingredient crust of dates, walnuts and sea salt. Then, it’s onto the filling. This filling is insanely creamy and rich. Bonus? It’s entirely naturally sweetened thanks to maple syrup. It gets its tartness from lemon juice and just a hint of apple cider vinegar. And the subtle, white chocolate flavor comes from the melted cocoa butter. One bite in and my eyes rolled back. That’s when you know it’s a keeper. I can’t wait to hear what you all think of this recipe. I think you’ll love that it keeps in the fridge without getting too soft and can be left at room temperature for serving (for up to a couple hours)! If you give it a try, let us know what you think by leaving a comment and rating it! And – our favorite – don’t forget to take a picture and tag it #minimalistbaker on Instagram so we can see your creations! We love seeing what you come up with. It’s my favorite evening entertainment. Cheers, friends! 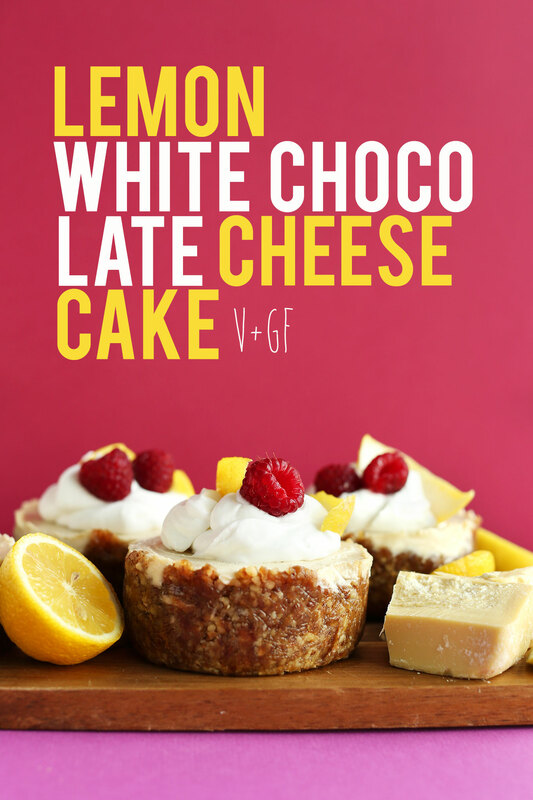 Amazing 10-ingredient White Chocolate Lemon Cheesecake made entirely in the food processor or blender! So rich, decadent, and satisfying you'd never guess it was vegan and gluten-free. Next add nuts, salt and process into a meal. Then add dates back in and blend until a loose dough forms - it should stick together when you squeeze a bit between your fingers. If it's too dry, add a few more dates through the spout while processing. If too wet, add more almond or walnut meal. Cut out parchment paper into circles the shape of your ramekins, muffin tins or pan (see notes for size options). In addition, to make removing the cheesecakes easier, cut out two strips of parchment paper per ramekin and lay them in an "X" shape at the base. Top with circle shape. This creates little tabs that make removing the cheesecakes easier to pop out once set. Divide crust among serving dishes and carefully press with fingers to distribute. To pack it down, use a small glass or the back of a spoon to really press it down, allowing some crust to come up the sides. If it sticks, separate the crust and glass with a small piece of parchment paper. Set in fridge or freezer to firm up. 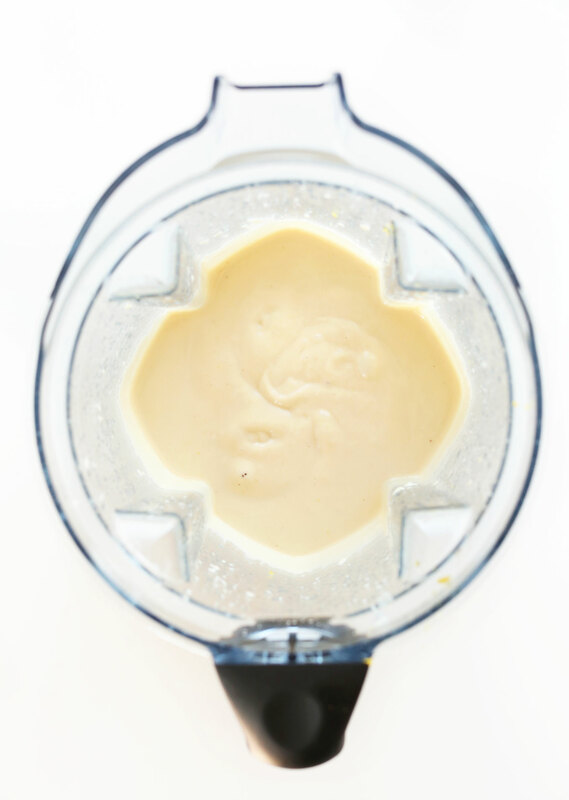 Add all filling ingredients to a blender and mix until very smooth - up to 2-3 minutes. If it won't come together, add a touch more lemon juice, maple syrup/agave or a splash more almond milk as the liquid should help it blend better. Scrape down sides as needed and blend until very creamy and smooth. Taste and adjust flavor/sweetness as needed. Divide filling evenly among the ramekins (or other serving dish). Tap a few times to release any air bubbles, then cover loosely with plastic wrap and refrigerate until set - about 6-8 hours depending on size of dish. Expedite this process by popping them into the freezer for at least 2 hours. NOTE: They will come out much easier after being in the freezer! Once set, run a butter knife along the edge and gently remove by tugging on the tabs in an upward motion. They should pop right out. If they aren't quite set, pop them in the freezer for 15-20 minutes and they should come out easily. Top with a touch of coconut whipped cream and fresh berries, or as is! See notes for storage. * If you don’t have cocoa butter, either add 1/4 cup more soaked cashews or sub 1/2 cup softened vegan cream cheese for similar results (amounts as original recipe is written // adjust if altering batch size). * My ramekins are medium-sized - about 3 inches wide at the base - and this recipe made enough for 4 (as original recipe is written). You can also use a standard size springform pan, or use a muffin tin! * Nutrition information is a rough estimate for 1 of 16 servings (4 slices per small cheesecake) without additional toppings. * Adapted from my 7 Ingredient Vegan Cheesecakes. 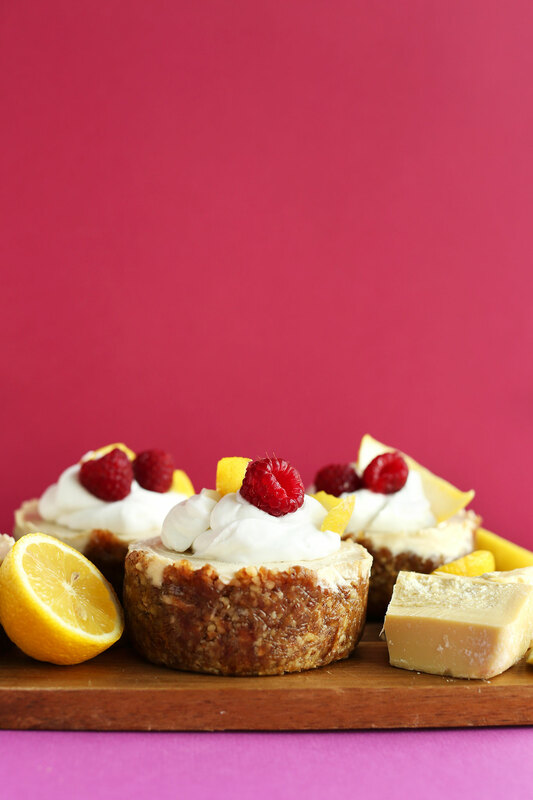 *These cheesecakes keep in the fridge loosely covered for up to a few days. Freeze in a freezer-safe container for up to 2 weeks - to serve let thaw at room temperature. Best when fresh! The filling: followed recipe adding at least 1/2 cup extra cashews [soaked extra just in case]; then followed recipe except: I held the milk and ultimately decided I didn’t need it (I didn’t) and omitted the vinegar (it was lemony enough). I used cocoa butter which I found at a local chocolatier [it was cheap too] – so if anyone makes chocolate in your community, that’s a possible source. But GREAT basic recipe, got lots of rave reviews. Thank you to Dana/Minimalist Baker and all contributors. Can I use mct or avocado oil as opposed to Olive oil? This was incredible!! I swirling in raspberry jam right before freezing to create a vegan version of my beloved white chocolate raspberry cheesecake from The Cheesecake Factory. My boyfriend and I are both dairy free, but cheesecake is our favorite dessert. I’m so happy to find something that mimics the texture and flavors so beautifully! A few adjustments: I made a graham cracker crust since I had extra graham crackers laying around after Christmas (and didn’t feel like venturing out in the cold weather just for dates). Like I mentioned above, I added raspberry jam. I also used 1/3 cup of maple syrup because I prefer more tart desserts and I knew I would add the sweet jam. I also tripled the vanilla because of who I am as a person. I also likely used far less lemon juice than the recipe required– my three lemons didn’t yield much and I completely forgot to add the zest! It was still amazing, just less “lemony” than what the recipe intended, I imagine. I happened to have cocoa butter on hand because I use it for homemade lotions, but I wonder if you could accomplish a similar effect by melting white chocolate? Since white chocolate is essentially just cocoa butter, sugar, and vanilla. Maybe I’ll try that next and find out! Thanks for sharing your changes, Kate! We’re glad you enjoyed it! Made this last weekend as we have some vegans in the family who are allergic to dairy. It was really good! Yay! Glad to hear it, Patti! Releasing tiny bursts of concentrated flavor from cinnamon sticks, nutmeg, and citrus rind. More slender and with smaller holes than rasp graters, zesters make hundreds of fine cuts. They’re ideal for lemons and limes, since the tiny holes won’t pick up pith (the bitter white part of the skin). The five- or six-hole ones, called lemon or citrus zesters, are good for making lemon curls for martinis and espresso. I was wondering if you had any suggestions for substituting the walnuts? 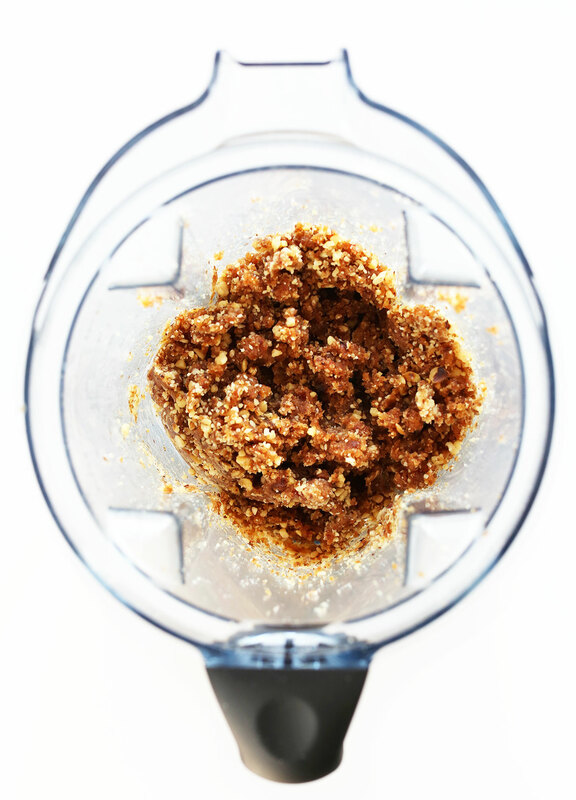 I am allergic to nuts and wanted a solution because this recipe looked too good not to try! Hi, this recipe looks great! Just wondering if it would work the same with cacao butter as with cocoa butter? Thanks! Hi Serena! If you don’t have cocoa butter, we recommend either adding 1/4 cup more soaked cashews or sub 1/2 cup softened vegan cream cheese for similar results. We haven’t tried it with cacao butter! Hi Paula! I’m not sure that would work, but report back if you give it a try! I made this but left out the oil (didn’t see what value it could add) and vinegar. I increased the coco butter to 100g and used half agave and half maple syrup. I topped it with fresh raspberries. The best vegan cheesecake ever. I am just venturing into vegan recipes and I tried this and failed miserably…. I think I over blended as the whole mixture curdled and went lumpy. What is the texture supposed to be like…. I am sure I didn’t blend it for more than a couple of minutes. I used golden syrup instead of maple would that make a difference? Hi!! This recipe looks amazing! Just wondering if I could make it as one single cheesecake, or if that will mess up the cooking? Hi Sarah! We haven’t tried it, but I think it would work to do that. If you try it, report back on how it goes! This recipe looks incredible and I would love to make this for Christmas! I was just wondering though, could I exclude the oil in the recipe? Would it change the end product? I left out the oil and increased the coco butter to 100g and it was perfect. I think the oil would ruin the flavour and the coco butter was too little in the original recipe to detect any chocolate taste. Hi Jane! You can use foil or a cake carrier if you’d prefer! What modifications could I make to bake a cheesecake with these flavors? 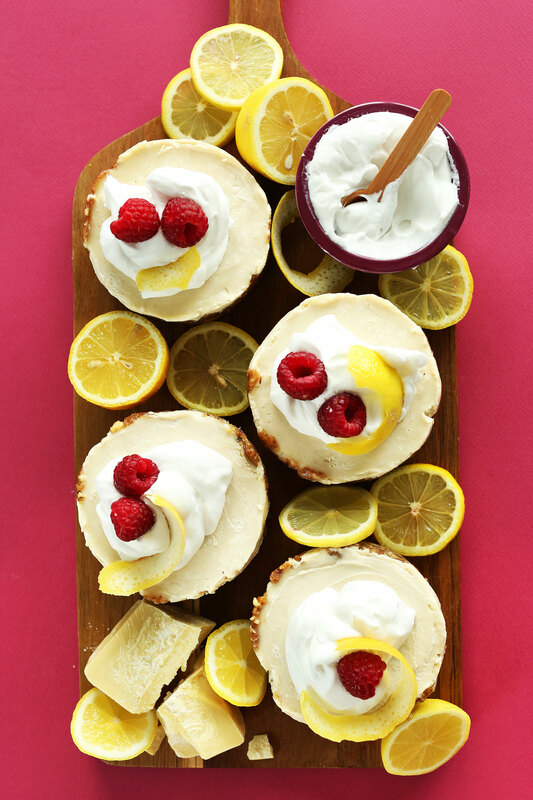 Any ideas for modifications if I wanted to make white chocolate cheesecakes without the lemon? hoping to avoid too much coconut flavour. Hi Averee! You can leave the lemon out to make it a white chocolate cheesecake! Hi, can I sub coconut butter for the coconut oil while still using cocoa butter? Just wondering since I have a lot of it; would it change the consistency? Hi Cristie! I would stick with oil or coconut oil! Thank you so much for this incredible cheesecake recipe!!!! I made it today and I absolutely loved it!! Definitely a keeper :-) I accidentally left out the almond milk but I don’t see a need to add it back in when I make this again, as the filling texture seemed perfect without it. And since lemons vary widely in size, I used the standard that I learned a while ago (from the Kitchn blog) that “juice of one lemon” = 3 tbsp of juice, and this worked well (my lemons were huge and I got 9 tbsp from just two of them). Hi, I need this cheesecake to set because I plan to sell it at a bake sale. Can I use 1/2 a cup of cocoa butter and not use the olive oil? Any suggestions welcome. Thanks. This turned out delicious, but following the recipe exactly makes *super* runny filling. I was not convinced it would set, and luckily I had soaked extra cashews, so I literally doubled the amount of cashews from 1.5 cups to 3 cups. That created a much more reasonable consistency. If I were to make this again I would definitely forgo the 1/4 c almond milk so I could use fewer cashews (they’re not cheap, even from the bulk section). 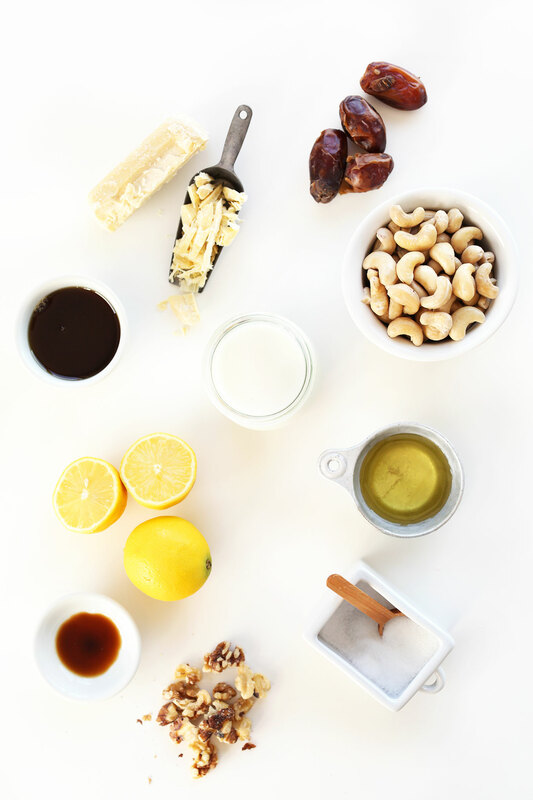 I do recommend soaking extra cashews so you have the option to add more if you want a thicker consistency. The recipe turned out absolutely delicious. I wouldn’t say it’s reminiscent of cheesecake, more like a creamy lemon tart (juice of 3 lemons is a lot of lemon juice!). To get a more cheesecake-like product, I’d probably use only one lemon. Just finished making this, and it is chilling as I type. I didn’t have coco butter, so I subbed melted coconut cream and used coconut oil. I figured this was going to give the cheesecake a strong coconut flavour, so I decided to go with that, and used limes rather than lemons. Hello tropical vegan cheesecake! YUM! I had a tiny taste of the filling before pouring it into the crust – wow!! so delicious, and so smooth. Planning to serve tomorrow topped with coconut whip and fresh raspberries. THANK YOU. This is my son’s 12th birthday cake and he is going to love it. Haven’t tried any recipes yet-the white chocolate cheesecake is on my agenda tomorrow for an anniversary party. I’m writing in advance to Thank Thank Thank You for you for having metric measurements listed. I never realized until I started baking, how much more Accurate they are. A ‘cup’ of almond flour, for example, can be all over the place in quantity which can skew the finished product. 100 grams of almond flour is exact. Good job?? Of course! You will love this one. Good luck! I loose your recipes! I want to try this cake for my friend’s birthday! I have a 10 inch springform tin. Would you recommend doubling the recipe? I would! Good luck, Freya! Cannot wait to serve to our dinner guests this evening. Chilling in the freezer as I type this. I was also licking the spatula after making the filling. So delicious! I used coconut butter since I didn’t have cocoa butter, and it seems to have worked just fine. On a separate note, I’ve only recently discovered your website, but the husband is making your roasted red pepper pasta dish. I can’t wait to see how it all turns out, but right now our kitchen smells divine! Love the idea of simple, easy to follow, health-conscious recipes. Looks yummy. Been vegetarian for 40 plus years. Now very seriously looking at going vegan. High speed is pretty critical to get it creamy and smooth! I made this for my birthday and it was a hit with my parents! It was quite acid, though, despite only putting half the lemon juice as suggested and all the sweetener as suggested. Did you maybe use xsmall lemons? This looks fantatsic! Ive not had cheesecake in years! Would it be possible to make a white choc and raspberry cheesecake with the basis of this? Yes, I think so! Let me know if you experiment and what you find! Thanks Tsholo! I bought mine on Amazon (linked above)! I haven’t seen it anywhere in stores, but I would guess it’s available at some health food/specialty stores. Agh, sorry, pressed the wrong button! Anyways, tried to cover the cashew aftertaste up with more lemon juice and agave, but I could still taste it so next time I’ll just go buy some cocoa butter! Also, the vinegar should be a must for this! It really does give it that extra kick. Thanks for the recipe!! How gorgeous!! Quick question: what kind of olive oil did you use? I generally use extra-virgin (for all sorts of applications) but am wondering if something milder would be more appropriate here… thanks! It won’t matter much here, as it’s so mild! But I use regular olive oil. Thank you for the quick response. That info is very helpful in figuring out portion size. Also, cannot thank you enough for including nutritional data on all recipes. That makes your site a five star in my world! So I’m thinking 1/4 of a small ramekin would be like two bites? The photos are absolutely gorgeous! Because it’s quite tall and rich, it’s actually quite a generous serving. Probably 4-6 bites. This looks yummy!! I want to try for my sisters birthday. Will this recipe work for a normal pie size? Hi Lauren. I’d recommend just leaving it out. It’s not essential to the recipe! Omg! This was soooo good! First vegan cheesecake I’ve tried and I loved it. I made it for a friend who is dairy free and she said it was the best thing she’d ever tasted. They all got eaten and I’ll definitely make again. I used a gf biscuit base as I love biscuit bases and it worked really well. Yay Yay! So kind. Thanks for sharing, Lauren! This is my favorite cheesecake recipe on the site! You are the sweetest type of friend! I love that you went out of your way to make something special for her that she could eat. I’m sure she appreciated it so much. It’s so hard to find yummy dairy free and gluten free desserts. Made this and it was awesome!!! Best vegan cheesecake EVER. Hi Dana! I love this recipe as is, but I’ve been tasked with making a key lime pie for my co-worker’s birthday. Your key lime pie recipe is also awesome, but I’d prefer to go the non-frozen route. Do you think I could make it work with this recipe if I subbed limes for lemons? I have to say though… to me me it tastes EXACTLY like a white chocolate keylime truffle! The description and pictures of this cheesecake were SO good that I was practically drooling, and so excited to make it. I followed the recipe to a T and it turned out nothing like the description :/ first the consistency of the ‘cheesecake’ was not nearly as solid/firmed up as yours. That wouldn’t be a problem but the taste was just not good. Overall it tasted like a lemon lara bar – which is great if you like lara bars for a snack, but it tasted in no way like a white chocolate lemon cheesecake, or even like it was supposed to be a dessert. What a disappointment! I’ve tried other things from your website though and they were great. Made this for a barbecue. Super easy, fast and yummy and everyone loved it. Batter didn’t seem too white chocolatey but once it was set it totally was! I topped with coconut cream and coconut butter stars (silicone mould). Used a mini cheesecake pan with removable bottoms so didn’t have to do the parchment paper trick. Made about 12 mini ones and then had extra to make two very thin 4inch spring form cakes too. Oh wow, this cheesecake looks like a dream! I love cocoa butter! I’ve decided I’m making this for my parents when they come up to visit in a couple weeks! They come up from FL a few times a year and I always try to make a vegan dessert (or two!). 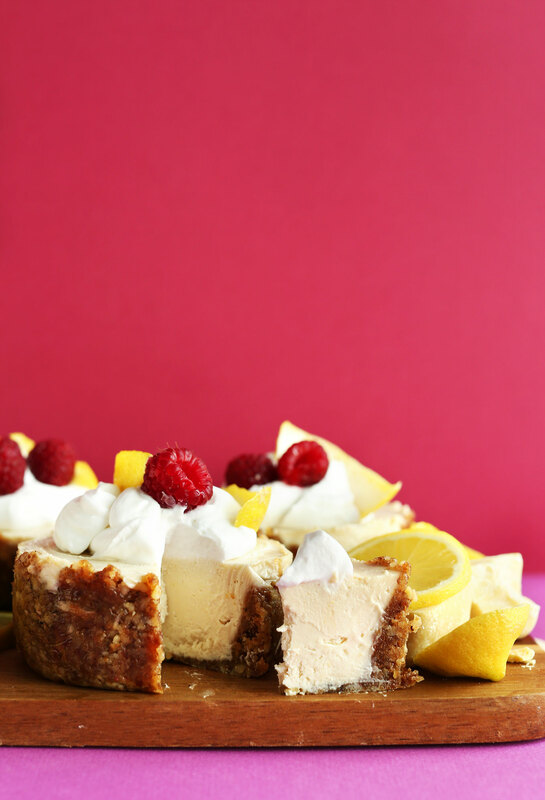 This cheesecake is 100% on my list! I just made these today and they are so good! I’m not vegan, so instead of cocoa butter, I just substituted it for regular old white chocolate and used coconut milk instead of almond. I love the cashew base to make these, so much easier than making cheesecake the old fashioned way. This recipe is awesome! Would it be possibly to replace the lemon juice with rose water, to make a rose cheesecake? Forgive me if I’m overlooking it but where is the white chocolate in this recipe? Never mind, the cocoa butter does that. :D It smells like chocolate and tastes like it, too! I think you’ve created the perfect dessert! awesome recipe and stunning photography! i signed up for your food photography school and i’m really getting a lot out of it. thanks for sharing the knowledge! Thanks for the kind words! Glad you’re enjoying the FPS! One ingredient I haven’t used is cocoa butter – I’ve used coconut butter, but I’m guessing it’s not the same thing. I love the idea of using a bit of cider vinegar for extra tang and bite of acidity. These would be perfect for guests. I have to think when the next potluck is! It’s not the same thing, but it may work! Never tried it myself. Hope you love this one, Dawn! I used coconut butter because I could not get cocoa butter and it worked fine. I will be keeping my eye out for cocoa butter though. This looks great! I have yet to use cocoa butter but I am up for the challenge haha. The fact that it stays firm is more than worth the “risk” purchasing it. I have a lot of work functions that I need the dessert to sit out for a bit which is where my past cheesecakes fall a bit short. Thanks for this ingenius recipe! Lovely! This would be perfect for entertaining. Let me know if you give it a try, Jennifer! ha! Hope you love it, Jennifer! These looks AMAZING!! the pictures are making me hungry too! Never used cocoa butter before, but will have to give this a try! Great post. This looks delicious! I would love to try to make these! Thank you for sharing! Also, could it melt outside (preety hot at these days).. I would serve it immediately from the fridge! Depending on how high up your crust went up the sides (the higher the better!) it should keep at room temperature for a couple of hours for serving. Place back in the fridge after that to keep fresh. Good luck! I’m going to try these today for Mother’s Day. Too late to procur cocoa butter so I will try using the coconut options for lemon coconut cheesecake. Thanks for the options! Lovely! Hope your mom loves it! I LOVE the date base! Tastes like cookie dough! This looks so good that I must have a go at it! This looks insanely good! White chocolate was always my favourite growing up but I’ve since moved over to the dark side ;) Not that that will stop me trying this. Desperately trying to think of an occasion coming up which would warrant such a decadent dessert! Hi Dana, I find you only have to soak cashews for about 2 hours even in cold-ish water to get a creamy, smooth consistency. I found soaking overnight to be unnecessary. Just a tip for this who want to make this recipe and don’t want to wait for the next day. I know you added the hot water method which also works like a charm. This recipe looks bomb!! Thanks Zoe! Haven’t tried that myself, but I do love the 1 hour in hot water for a quick fix! How do you get 16 servings from 5 3-inch cakes? Thanks for asking, Dina! It was my error (now amended) – the recipe makes 4 cheesecakes using my ramekin size, not 5. And because these are so rich, I divided each cheesecake into 4 servings. Hope that helps! These look insane! Definitely going to make this sometime soon. Looks wonderful but allergic to cashews. Any ideas? Hmm, that’s tough! I would recommend adding 1/4 cup more cocoa butter and subbing the cashews for vegan cream cheese! You could try macadamia nuts unless the issue is an overall nut allergy vs just allergic to cashews. So dang pretty! I’d never even thought to eat cocoa butter–thanks for the great tip! A friend was looking for a vegan cheesecake recipe earlier this week and yours was the first place I pointed her. This one looks like a hands-down winner as well! Thanks Amy!! Hope you ladies give this one a go! Just put some in the freezer for a friend’s birthday dinner. I filled 11 in muffin tins, no cocoa butter so skippedthe almond milk and the texture was just right. I went from skeptical to licking the blender in a heartbeat! Can’t wait for these to set, thanks for the great recipe! Wonderful! Let me know how you like it! A huge hit! Everyone thought these “key lime pies” were amazing. We ate these straight out of the freezer, as they melted quickly at room temp. (I’m not blaming the recipe, just…Georgia. Can it be winter again soon?) The cocoa butter probably would’ve helped them hold up longer. Also, I ended up with a lot of extra crust mixture, so will probably reduce the amounts next time on that. No complaints, though–it was delicious rolled into date/walnut “truffles” to pop in your mouth every time you open the fridge! 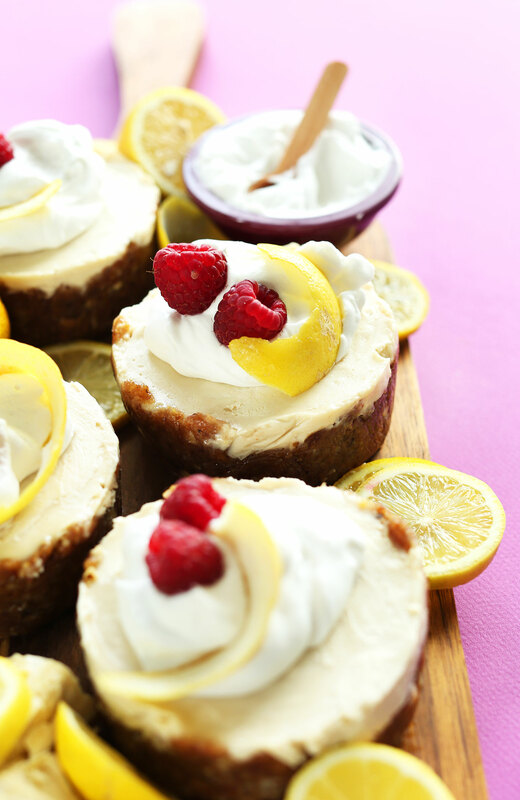 I’ve only just discovered what a great combination lemon and raspberry is myself and made my own little cakes, but I hadn’t thought of a cheese cake, such a brilliant idea! Looks incredibly delicious! I love your other cheesecake recipes and I have loved seeing bloggers use cocoa butter in vegan recipes, and have yet to try it! I will definitely be ordering some, it’s so versatile! It’s worth the splurge for the scent alone! This looks insanely beautiful! I’ve always wanted to try cocoa butter- how can that NOT be amazing?! But I have yet to take the plunge. Thanks for including those alternative options, I’m excited to try this with extra cashews. Gorgeous styling and scrumptious recipe! Definitely! Thanks Sydney. I figured not everyone would want to order cocoa butter, but if you’re tempted, take the dive! It’s so worth the splurge! Definitely got hungry looking at this!